He since has put up a wooden fence along much of the property’s frontage on Cliff Dawson Road and cleared frontage on Daniells Bridge Road. He also has purchased an additional 16 acres from the developer of Downs Creek Farm subdivision on Daniells Bridge Road in June and combined that with the 188 acres he purchased in June, creating a 204-acre parcel. In addition, Mulkey owns six lots in the section of Old Farm subdivision accessible from Cliff Dawson Road and has filed site modification plans with the county to combine four of those lots. The combined lots as well as the two additional lots in Old Farm owned by Mulkey back up to the 204-acre tract Mulkey has assembled through the June purchases. B.R. White, director of the Oconee County Planning Department, told me on Oct. 14 that he had advised Carter Engineering Consultants that the 188-acre tract needs to be downzoned from its current R1 classification to A1 to accommodate plans for a farm pond or lake on the property. Carter, 3651 Mars Hill Road, represents Mulkey, White said. White told me yesterday (Friday) that he had not yet received any request for the downzoning. The 16 acres from the Downs Creek Farm present an additional problem, White said, because they are part of a special tax district for street lighting in the Downs Creek Farm subdivision. Mulkey submitted plans for the modification of the four lots in Old Farm on June 6, and construction is underway on the lots to eliminate a cul-de-sac and change the driveway entrance. Those four lots total 5.4 acres, and the additional two lots adjoining them and running to Cliff Dawson Road are 2.1 and 2.3 acres. The 188 acres Mulkey purchased in June is the last major undeveloped parcel on Daniells Bridge Road. It is across from Lake Wellbrook subdivision on Daniells Bridge Road, which was developed in the late 1990s. The 188-acres abut Meadow Springs subdivision on Cliff Dawson Road, a master plan development project that was partially dormant until 2013. 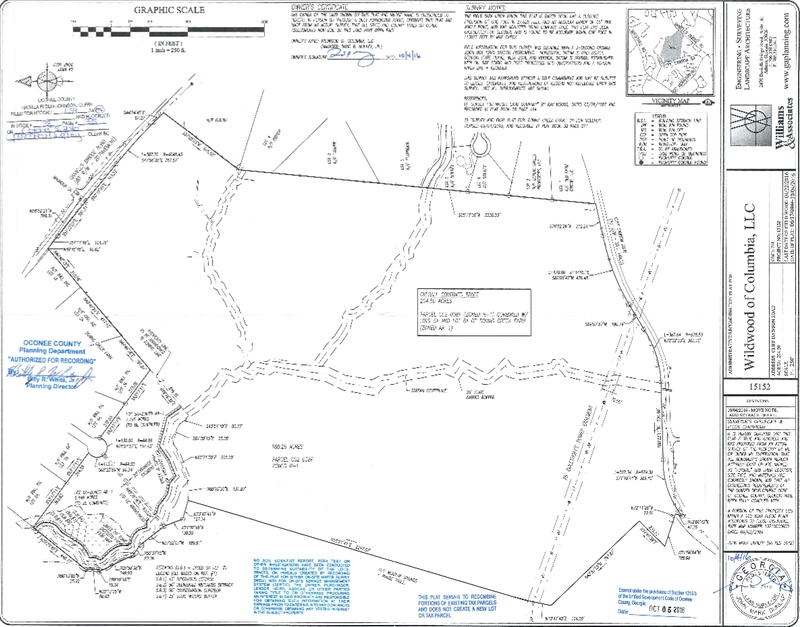 The 188-acre property had been zoned by the Oconee County Board of Commissioners for a 193-lot subdivision on March 4, 1997. According to Oconee County tax records, Rebecca Barnette sold the property to Wright Land Company for $1.7 million in April of 1997. Wright Land Company transferred the property to Ron & J.L. Wright Jr. in December of 2007. The Wrights, major Oconee County land owners and developers, sold the property to DRM EAT LLC on June 6 of this year for $4.4 million. The Oconee County Tax Assessor Office labeled the sale as of questionable fair market value. DRM EAT LLC incorporated on March 2, 2016, with Athens attorney Mike Morris as the organizer. DRM EAT LLC sold the property to Wildwood of Columbia LLC on June 16 for $4.5 million, which the Tax Assessor Office also labeled as of questionable fair market value. Wildwood of Columbia has been incorporated as Timberline Crossing LLC since March of 1999. Timberline’s name was changed to Wildwood in 2015. According to the Georgia Secretary of State Corporate records, Wildwood of Columbia was changed to Brooklake Farm LLC on June 23, 2016, though the Oconee County tax records still use the Wildwood name. Wildwood of Columbia LLC has a mailing address of 1550 Timothy Road in Athens, as does Brooklake Farm LLC. Wildwood of Columbia LLC purchased the two lots from the 11-lot Downs Creek Farm subdivision. Five of the six lots in Old Farm subdivision controlled by Mulkey are listed in Mulkey’s name, with a Darby Hill Lane address in Old Farm. 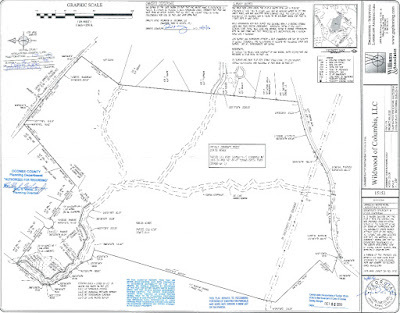 The sixth lot in Old Farm is owned by Berlin Street Properties LLC, also with the 1550 Timothy Road address in Athens. Only one of those six lots in Old Farm owned by Mulkey has anything built on it. The property at 1596 Derby Hill Lane has a home on it, with total property and improvement value of $827,573, according to the county’s tax records. Tax records show Mulkey purchased those six properties individually from January of 2010 to January of this year. The insiders stand to make a fortune. It's not necessarily what you know, but whom you know. It is for us little people. Then there are the Others. Wow, that's an incredible return on investment. We need more subdivisions in Oconee like we need a hole in the head. And the Bojangles across from Oconee Primary and Elementary Schools is ridiculous. Thank you Mr. Ken Beall. If this is downzoned to agriculture, it will take 195 lots zoned for residences off the market. Yes, Beall, Gonnsen and Company did handle the rezone back in 1997. Yes, Beall and Company did handle the rezone for the two fast food restaurants on Hog Mountain Road across from the schools. That is a very strange area for an agricultural enterprise, plus it is a lot of money for a "farm" unless it is to be a hobby farm for a wealthy person. None of this makes much sense. Perhaps the "farm pond" is actually planned to be a lake for a subdivision of the future, but they hope to get some outside funding for farms to create it? Glad someone noticed the need to change the zoning to accommodate the "farm". Will be interesting to see what happens. Thanks for keeping up with this. I believe if you dig a little you will find out what is probably in store for this property. I have been following this since June and will continue to do. I will update the story as I am able to learn more. Whay is is so hard to believe that a guy with some money wants to have some area away from all the clowns that want to mind his business?